The way I feel about sequins is sorta the way avid crafter's feel about glitter. I simply can't get enough! If society accepted it, I'd be more than happy wearing sequins from head to toe. But seeing how sequin jumpsuits are somewhat of a rarity, I'l have to settle for sequin separates and accents instead. :) Currently feeding my addiction is this fab sequin blazer from ellelauri, which I thought went perfectly with my new Mimi Boutique handbag. I LOVE SEQUIN! and you wear it so beautifully! I like your bag and heels too. Burgundy jeans is just number one! Beautiful sequin jacket and I love that emerald green bag! The weather looks lovely in CA!! Congrats on all the success Anna! I just read the post on LaurenConrad.com earlier today:)! I love your sequin blazer! It's gorgeous! wow you look amazing, really! I adore the jacket, so sparking! Such a cute outfit (as always). Perfect layers. So happy to follow along through the past year and see all you have accomplished!! Can't to see what is ahead for you in 2013. This is one of my fave outfits of yours Anna, adore the sequin jacket! Fantastic blazer and bag!! Love your style!! Omg. You look amazing. This outfit is one of my faves. So Chic. Great outfit! Love your hair straight! Hope you had a fabulous festive break with your family! I love this look, Anna! You look as fabulous as ever :) Hope you're having a fantastic new year so far! Cute outfit! I like the sequin jacket! Need this blazer in my life. Dying. Cute outfit! 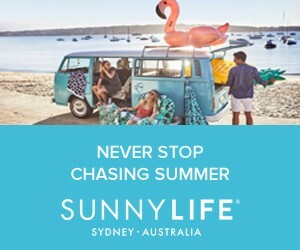 You shine all over! Love the Bordeaux colour on you, Anna! Anna, I'm so in love with this outfit. Your hair looks gorgeous straight. I absolutely adore this blazer! It's a great cut and obviously perfect! Wow this sequin blazer is really stunning. You look so beautiful. Love the whole style. Also love your beautiful hair. Love! The bag is all kinds of fabulous. I need that sequin jacket! It is beautiful! i feel the same way about sequins - never enough! Incredibly inspired by this outfit. Great job, Anna. Beautiful look!!! Kiss from Andalucía. These layers and mix of fabrics are PERFECT for this time of year! I adore the deep burgundy with the creme and gold - simply chic! Can't get enough of sequins neither! You look SO gorgeous! The color combo is just perfect and I love that bag, so out of control!!! Loooove that gorgeous sequined jacket! Sequins are a favorite of mine. Everyone needs a little sparkle! SOOOOO PROUD of YOU!!! 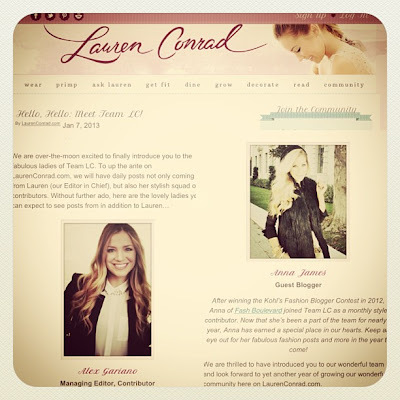 What a great accomplishment to be featured in Lauren Conrad's website! Again SOOOO PROUD OF YOU!! 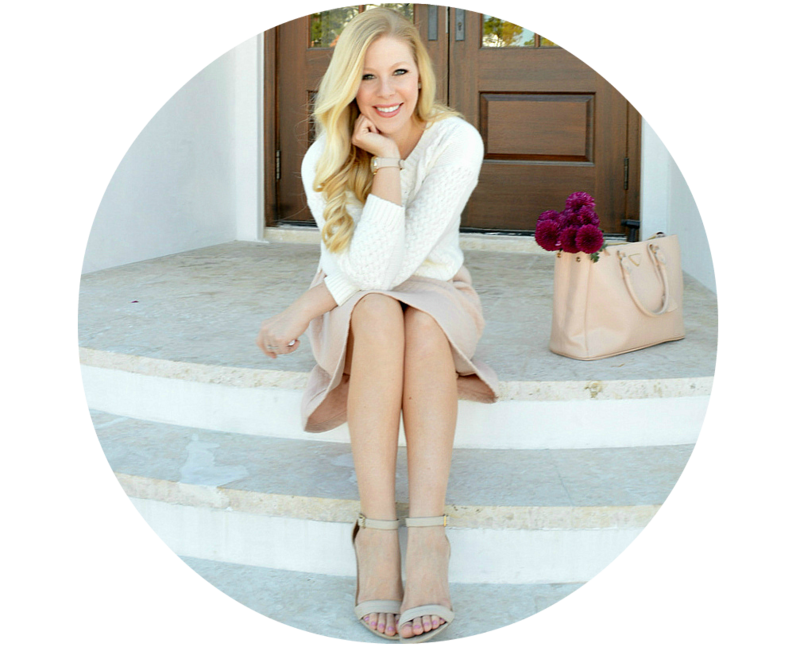 I am obsessed with this fall look! I have been sporting my oxblood pants recently but never thought to pair them with sequins and lace! Absolutely love that sequin jacket...so chic! I love this jacket, anything with sequins can be my friend! I'm crazy about this bag and the color of those pants!!! Gorgeous! My 2 favs together... lace and sequins! Congrats again on such an amazing opportunity to work with Lauren Conrad's team. Such an honor! <3 her! Really adore your jacket and heels. Beautiful! I love the combination of textures! Love the lace and sequins, and the color combo! Congrats on your success and working with Lauren Conrad! I love your sequin blazer! You look absolutely beautiful. Congrats on your fabulous 2012 and getting to work with all these wonderful women. I have no doubt that 2013 will bring you even more success and amazing opportunities! Lovely look! I love how you paired two textures with a pop of color. We posted today on how to stretch your shoes! All you need is baggies, water, and a freezer!! We'd love if you could check us out and leave a commment! Love the sequins and lace combo. So happy for you that 2012 was such a positive year, best of luck in 2013! As you know, J and I LOVE LOVE LOVE sequins. For every day. For any day. I have burgundy jeans too and I absolutely love them! I love how you styled them here with the sparkles! Love this look! I am somewhat fond of sequins myself :) Also really love all the bangles! Great outfit!! Loving your new bag! I actually found the best sequin, strapless bodysuit at lulus.com...part of their New Years collection. I seriously debated purchasing it! I love the sequin blazer! Great look & Happy New Year!! Gorgeous outfit!!!! Love it. If you get a chance check out my 30 in 30. You always look so glamorous! Love the gold sequins with the maroon pant, beautiful! Super cute! love your pants and the lace flowered top! I love sequins too and I love that blazer! So fun. Great work on LC's website. loooove sequins - this blazer is too cute! i neeeeeed those pants in my life! as well as that blazer! too adorable lady! Pretty jacket, especially in that gold. You are such an inspiration Anna! Love this look! You are beautiful! I am so glad I have been introduced to your blog! I love it!!! Love your bag and your jacket!!! I love this outfit a lot! The sequinned top has the softest color. As I always say, you're my inspirtion, congratulations on your sucess with your collaboration with Lauren Conrad and Giuliana! Not many people can wear sequins but you look stunning! I really love it! Love the oxblood pants! Would love to hear your thoughts on my latest outfit post! I soo love your sequined blazer, straight hair and cranberry pants. So cute!! You look awesome dear. Love your blog. I love your bag and your blazer, you look great! I am following...hope you will check out my blog when you get a chance! Love your sequin blazer, as always you look great hun! Flawless! I absolutely adore your bag! Such a beautiful emerald green color! What a cute look! Especially love that bag--adorable! Wow! You are beyond lucky to be able to work and write in the fashion industry, especially with Lauren Conrad. Your fashion sense is incredible - huge fan. So chic and glamorous! Love the accessories in here. Got my eye on your next posts. So cute! I love this sequin jacket with the lace top. You look so pretty! Love sequins with casual outfits! you look very nice! Sequins are definitely the best! Love your outfit! I love everything about this outfit! That blazer is amazing and the bag is gorgeous! Congrats on all the amazing opportunities you've had this past year and I'm sure you'll have many more for 2013! Love the mixture of colors and textures! Beautiful outfit! How's the pup?!? I have been out of the blogging loop lately. That sparkly blazer is a perfect piece to jazz up any outfit! Love! Your story is so inspirational! You really are an inspiration for young women to follow their dreams. Love the sequins and the lace, you look fab. I always look forward to seing your outfit posts, they make me happy! Love the combination of textures! Looks fabulous :) as always! I am basically in love with this outfit! Fabulous sequin blazer! Love your pants too! Omg im in love with this look!! There is something about burgundy that I love more than anything.